Kaldi Coffee Farm stores handle roasted coffee, imported goods from various countries of the world and original products. These stores are the ideal place to find Japanese gifts! We introduce their Shimokitazawa location. Shimokitazawa, located in Tokyo's Setagaya ward, just five minutes away by train from Shibuya, is known as the city's youth culture district. Its narrow streets lined with charming shops, cozy cafes, bars, galleries, and live music venues are bustling at every hour with young people in search of the latest trends and entertainment. One of the most popular stores in Shimokitazawa is Kaldi Coffee Farm, which has been in business here, growing at the same pace as the town itself, since 1992. Established in 1992, Kaldi Coffee Farm Shimokitazawa was the second store opened by Camel Coffee, the company operating the Kaldi Coffee Farm brand. With its stylish interior and colorful shelves, the store fitted in perfectly to the vibrant, ever-changing atmosphere of Shimokitazawa. Kaldi Coffee Farm soon won the hearts of the Shimokitazawa locals due to its warm hospitality. The practice of welcoming customers with a cup of coffee, now employed at most of the Kaldi Coffee Farm stores, goes back to the early days of this location. The coffee offered at the entrance is "Mild Kaldi", softened with milk and sugar. It is a drink that can be enjoyed by anyone, even by those who don't drink coffee on a regular basis. The core concept of Kaldi Coffee Farm is to deliver quality coffee and foodstuffs from all around the world at affordable prices. Kaldi Coffee Farm stores have a distinctive layout, with intricate alleys between the shelves that give customers the feeling they are on a treasure hunt. You never know what you'll discover when you turn around but you can be sure it will be something completely new! A flavor you might feel inspired to try for the first time, a type of snack that you've never heard of before, or a treat that might brighten up a friend's day - the Kaldi Coffee Farm stores are loved by their customers for their truly unique items and stimulating atmosphere. Roasted coffee is the product that Kaldi Coffee Farm takes most pride in. At least 30 types of coffee and coffee blends are available at their stores all around the year. Some of the coffee blends are created with a special event in mind, such as Mother's Day or Christmas, or are inspired by Japan's seasons. Needless to say, they are great for personal use or as special gifts. The brand name itself comes from the legendary Ethiopian sheepherder named Kaldi, or Khalid, who is said to have been the first to discover coffee. Another category of products that enjoys great popularity is their line-up of original products inspired by foodstuffs from various countries. In order for everyone to be able to taste flavors from around the world, they have also developed retort foods. The best part is that these goods are available at affordable prices. Moheji items: snacks, rice crackers, furikake (rice toppings), and miso soup. 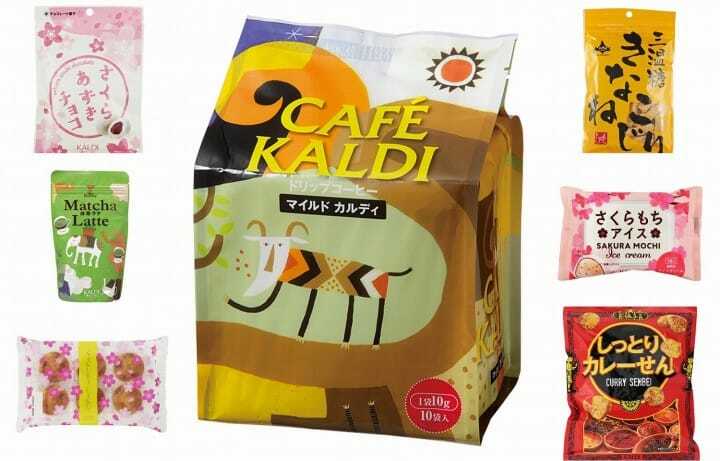 Since 2006, Kaldi Coffee Farm has an original brand dedicated to selecting and creating quality Japanese products. This brand is called "Moheji" and the products featured under this name are ideal if you're looking for items made in Japan. Moheji focuses on Japanese ingredients and foodstuffs gathered from all the regions of the country. The products are being selected based on their quality and taste. Regional foods or flavors made through traditional methods are particularly favored. For example, you can find miso soup types that are specific to various regions of Japan such as Kyushu, Hokkaido or Shinshu (Nagano). Salad sauces made with flat lemon from Okinawa or kabosu from Oita, snacks made with kinako (roasted soybean powder), and pudding from Hokkaido, and many other items are available under the Moheji brand. The Moheji item series is ideal for those looking for souvenirs from Japan. If you want to let your friends and family taste Japanese food, how about bringing home a package of Moheji instant miso soup? A package contains 16 small packs of miso paste and ingredients. It is light to carry and lasts for several months. Besides, few other foodstuffs better embody Japan's basic flavors than miso soup. Many items that can be found throughout the year at Kaldi Coffee Farm stores are ideal as souvenirs from Japan. Let us introduce a few that have a relatively long shelf life and are also representative Japanese flavors. Mild Kaldi is the brand's signature coffee blend. The mild type is aromatic and flavorful and can be enjoyed by anyone. A package contains 10 drip coffee packs and costs 448 yen. Matcha (green tea powder) enjoys great popularity as one of Japan's distinctive flavors. The original Matcha Latte from Kaldi Coffee Farm has just the right balance of matcha and milk. Adjust the richness of the drink to your preference and enjoy! A 150 g pack costs 378 yen. Kinako nejiri are twisted soft candies made with roasted soybean powder. Originally from Hokkaido, this snack is loved by people of all ages. The Kinako nejiri available at Kaldi Coffee Farm have a mild sweetness as they are made with soft brown sugar. They're an excellent Japanese snack, so do try them! A 150 g pack costs 236 yen. Senbei are Japanese rice crackers that are widely loved for their crispiness. However, the soft curry senbei available at Kaldi Coffee Farm are very popular for their soft texture. The curry flavor is rather rare for senbei. With just the right level of spiciness, these crackers are a great snack. A 100 g pack is available for 213 yen. "Okoge" means scorched rice and is a flavor loved by the Japanese because it brings up memories of homemade traditional meals. This flavor has been reproduced in the Okoge Senbei crackers available under the Moheji brand. A 100 g pack costs 226 yen. In addition to their regular items that are available all throughout the year, Kaldi Coffee Farm also offers season-limited products that are inspired by major seasonal events (*1). We visited in early spring, so we found their cherry blossom-themed line-up. If you're looking for special souvenirs or gifts from your trip to Japan, this type of seasonal items might also be a nice choice. Let us introduce to you three popular spring items. *1... These products are available for a limited period of time and in limited quantities. Ice cream flavored with cherry tree leaves is wrapped in a thin layer of soft rice cake (mochi), resulting in a heavenly taste! This is a treat that everyone in Japan looks forward to in spring. A piece is available for just 162 yen. Although it might not be appropriate as a souvenir, it's definitely worth trying while you're in Japan. The Sakura Azuki Chocolate balls combine the flavors of cherry blossoms, chocolate, and sweet red beans, the latter of which is a Japanese staple dessert. They have a relatively long shelf life so they make a nice souvenir, too. A 43 g pack costs 143 yen. This cherry blossom-flavored soft cake is also a great treat that's only available in early spring. A six-piece package costs 388 yen. Enjoy Your Souvenir Treasure Hunt at Kaldi Coffee Farm! If you go to Shimokitazawa, do stop by the Kaldi Coffee Farm store located close to the east exit of the station. One of the first Kaldi Coffee Farm stores in Japan, it is now part of the distinctive culture of this town. On the other hand, Kaldi Coffee Farm stores are available now in several locations in Tokyo and all over Japan. Drop by to get a glimpse of the inspiration that these stores bring into the lives of the locals.